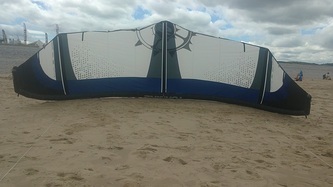 It probably goes without saying,, but this kite is big. It comes in a large bag and needs to be folded over threefold to fit inside! 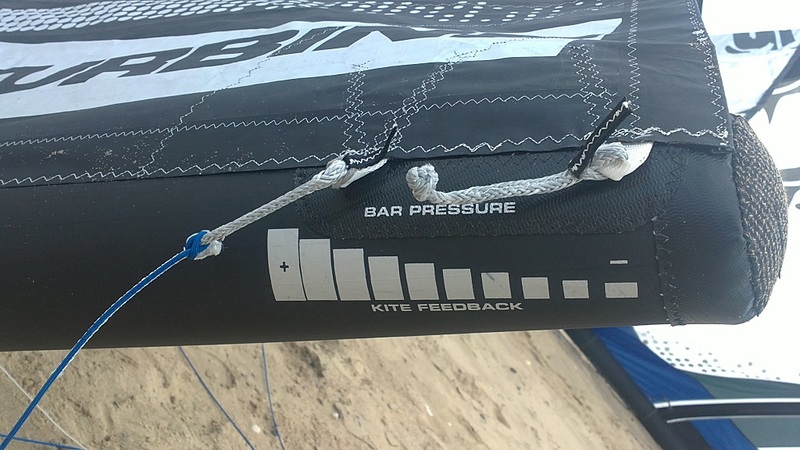 When you take a closer look at the kite, its clear that Slingshot haven't cut back on stitching or reinforcement - the leading edge seams are triple stitched and the construction of the split struts looks just as solid. 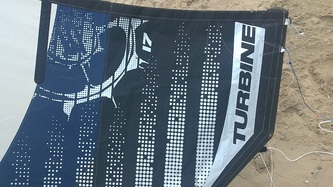 The Turbine has a similar shape overall shape to the Rally, but sports a different bridle; there is a pulley a short distance from the wingtip, through which a line connecting the rear line connection and front line bridle feeds. 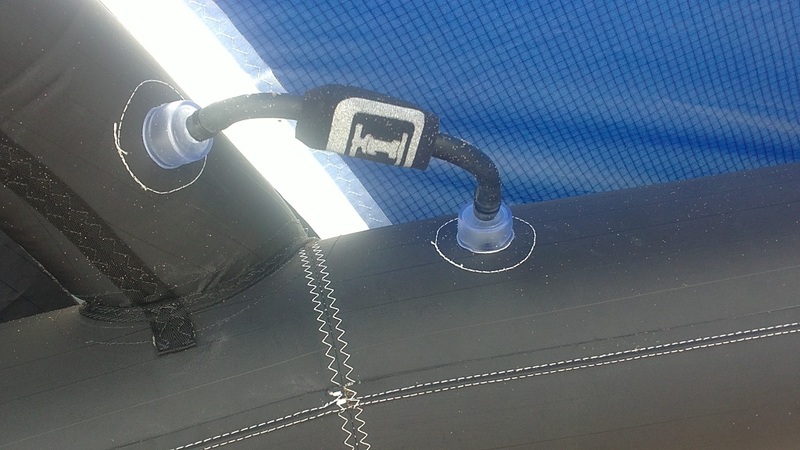 This is to reduce bar pressure on such a large kite and to give a smooth and responsive ride. The bar is very similar to anyone familiar with the Slingshot range and is identical to those used on the Rally. It is a weighty alloy bar with rubberised grip, 23" in length with 27m of standard heavy-duty flying lines. It has a small chicken loop and the usual below-the-bar clam cleat sheeting system. 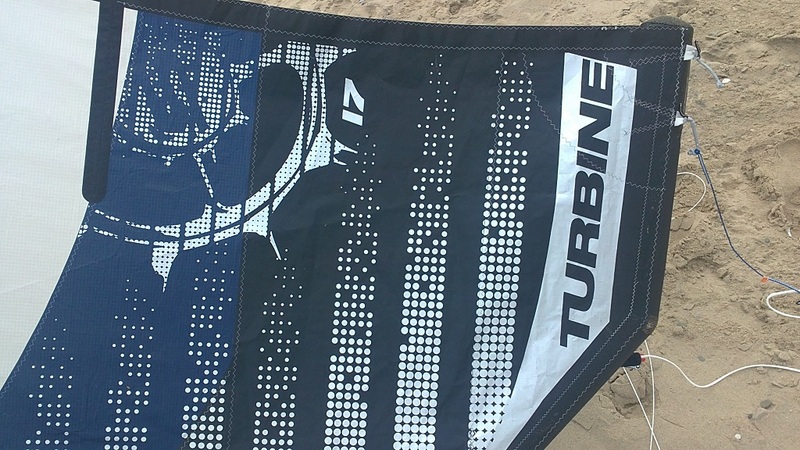 The Turbine feels very smooth through the sky and can be felt generating a considerable pull even when you can barely notice any wind at ground level. 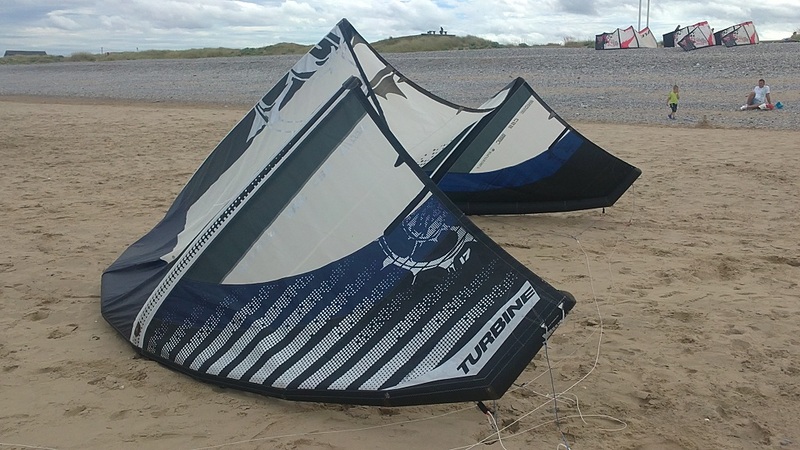 It turns at a good pace for a kite of its size and feels reassuringly stable even when the wind is variable and gusty, and is an easy kite to fly. 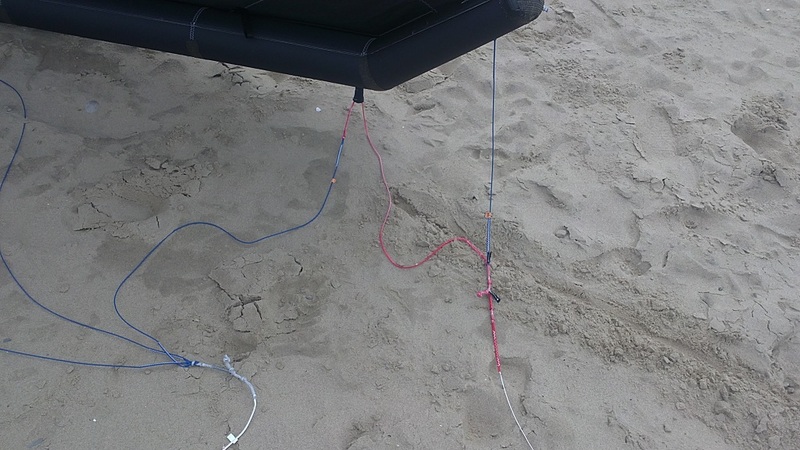 Light wind kitesurfing can be quite technical to master, especially when the wind is varying in strength a lot; yet the Turbine seems to provide a smooth clean pull even when conditions are poor. The large canopy of the Turbine works great for getting you out of the water and onto the plane initially, and once the apparent wind kicks in you accelerate up to a decent turn of speed, powering upwind. 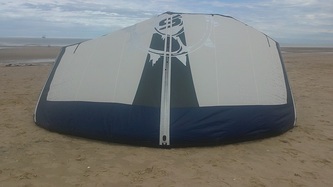 The kite generates some impressive pull when moved through the window, and can be manouevered through the air with ease. 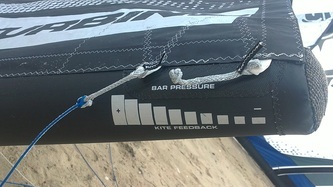 The bar pressure is light or medium (depending on which setting you choose) and gusts can be felt through the bar which provides a level of auto-depower. The sheeting of the kite is nice and linear and can be tuned to provide just the right amount of pull you desire. 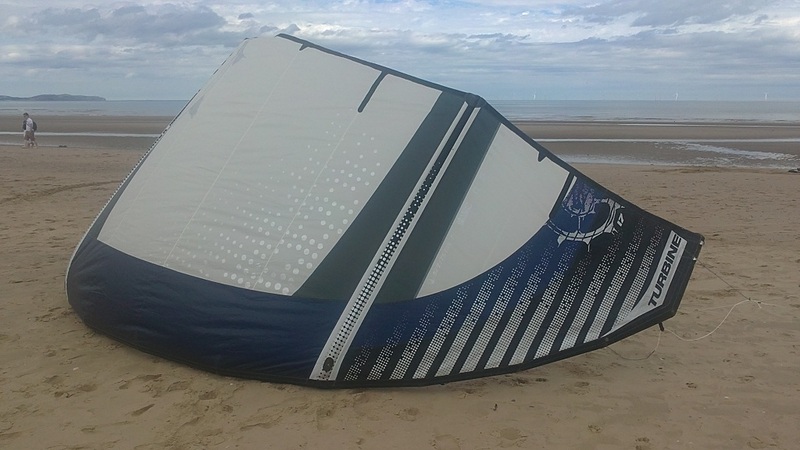 The large curvature of the leading edge helps a great deal with relaunch and aids getting it back up into the sky quickly and easily, although in light winds you can be somewhat at the mercy of the wind at the time. Slingshot have produced a great, robust, user-friendly kite for getting more time out on the water. It opens up light-wind flying to a much wider audience and is a very good performer in all disciplines and a real head turner on the beach and in the air! It comes well reinforced and truely is a lightwind kite for the masses.